The bus from Gangneung pulled into Sokcho at 10.30. 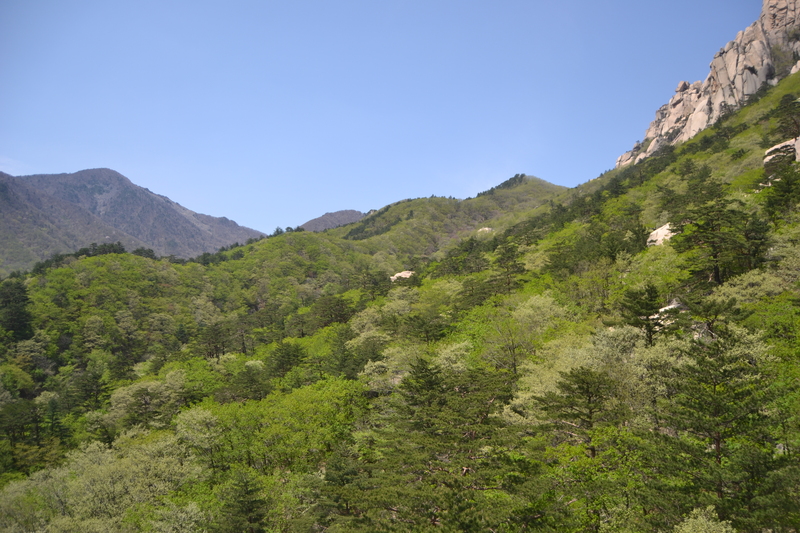 I spotted the guest house as we rounded the last corner and walked up there, dropped off my bags, picked up a map, and took a local bus out to Seoraksan National Park. 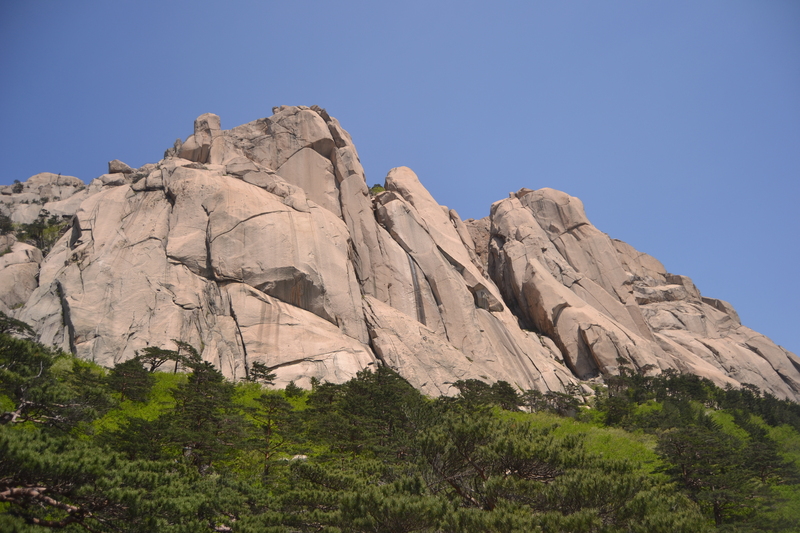 It was too late to think about doing the ten-hour round trip to the top of Daecheongong Peak and back; so I headed, instead, for Ulsanbawi which tops out at a more manageable 876m – still 50 metres higher than the world’s tallest building. I was as well-prepared as ever with a vague tourist map, no water and ordinary street clothes. The path, only gently sloping to start with, meandered past a kneeling Buddha and stone lanterns and alongside a river which had dried to a trickle and was lined with blossoming cherry trees, and over an ornamental bridge, past a temple complex with kingfisher blue roof tiles and exquisitely painted eaves, and on and into the depths of the forest of deep green firs and brighter green deciduous trees from which – in the distance – the jagged peaks protruded. I followed the path into the trees and over boulders and across more bridges and up and up, as the terrain became more difficult, and out onto a plateau where an ancient hermitage had been cut into the mountainside and up again to a spit of rock which I scrambled up and looked back across the expanse of the park into the floor of the valley way below. The peak, though, still brooded over me, hundreds of feet above. Its upper slopes looked more or less vertical. They were. There was an iron walkway up to the top with – depending on whom you ask – 800, 808, 888 or over 900 steps, which in any case is like walking halfway up the Empire State Building. I had aimed to get to the top without stopping but lost my resolve halfway up the walkway and stopped to rest, but only for a moment, because a sprightly old lady in luminous hiking gear surged past me and shamed me into pressing on. 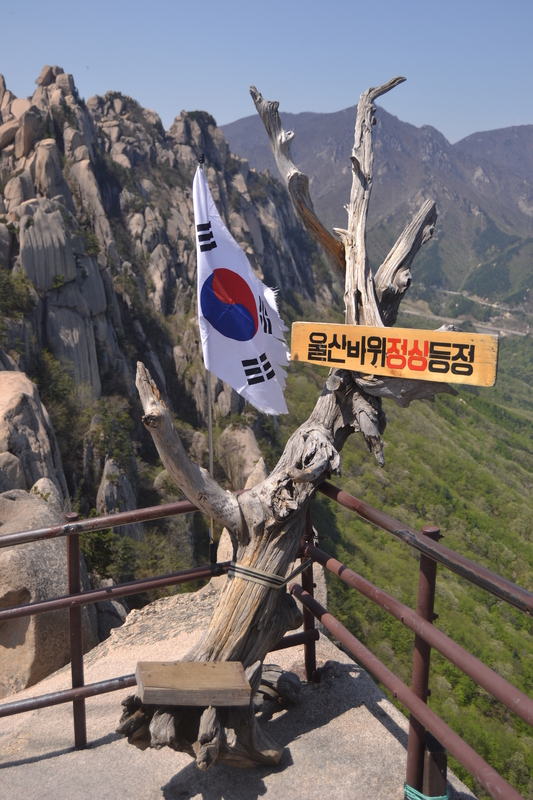 The reward, though, for reaching the peak was a breathtaking view across the park, across the countryside, back to Sokcho and on to the coast and out over the Pacific. It was mid-afternoon by the time I got down, too late for lunch, too early for dinner, but I stopped anyway at an outdoor restaurant and ordered the local dish known as squid sundae, which sounds a bit Heston Blumenthal, but has nothing to do with the Western dessert of the same name. It is a squid body stuffed with diced pork, tofu, tentacles and shitake mushrooms, steamed and sliced into rings. There was a shorter, easier trek through the woods, over rocks and bridges to the Yukdam Pokpo and Biryong Pokpo falls, and that passed an hour so before I got the bus back to Sokcho and poked around the fishing harbour and market and took the hand ferry across to the North Korean expat village (Sokcho was the wrong side of the border before the war and is an hour from the DMZ now). 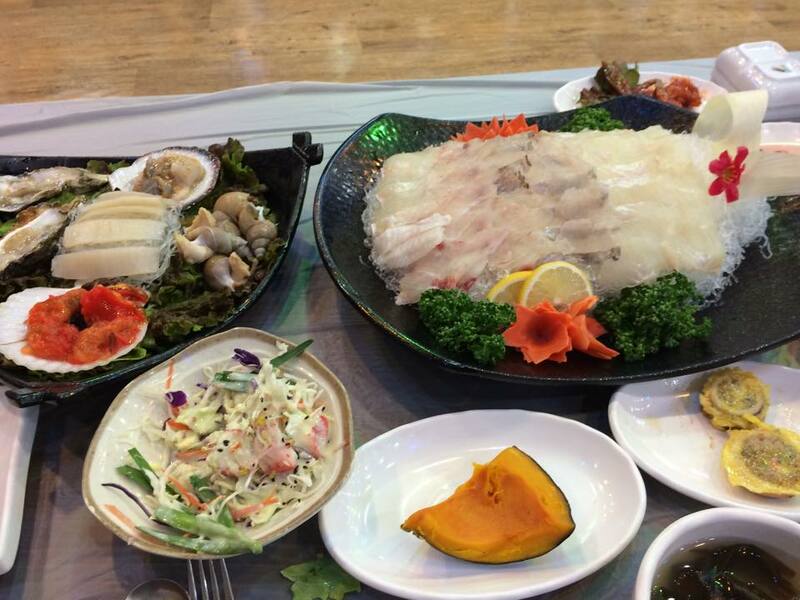 Koreans are said to go Sokcho just for the mudeumhoe (raw fish platter) in which the fish is sliced carpaccio-style and served on bean thread noodles with the tableful of side dishes you always get in Korea. There was enough, this time, for a small group: a fried fish, sashimi, oysters, whelks, squid sundae, squash, soup, salad, kimchee (fermented cabbage) and goodness knows what else. Thankfully you are not expected to eat it all. 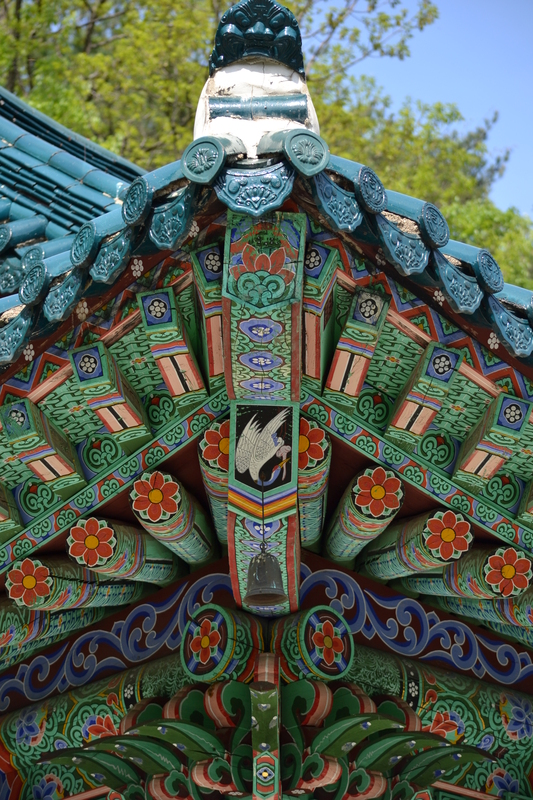 Then I was back on the intercity bus in the morning, heading for Chuncheon, the last stop en route to Seoul.